Mega Splash - who will be getting wet wet wet?? Pandora Elegant Beauty Pearl Hanging Earrings & Pendant in sterling silver features luminous white freshwater cultured pearls, accentuated with sparkling cubic stones. Patterns of Frost Pendant and Earrings set. Sterling silver and Cubic zirconia, vintage-style, stone encrusted flower shape makes it a perfect accessory. Go in the BIG draw to win a Fantastic iPad Mini. Enter the draw outside Room 4. One entry person, winner must be at the draw to claim the prize. Draw to be held at 1pm. Come and meet Walter from Sticky TV. Walter will be making a special visit to our Gala Day this year to check out the rides and fun on the day. He will be at school all day to keep and eye out and say Hi! New High Speed "Cannonball" Slide! 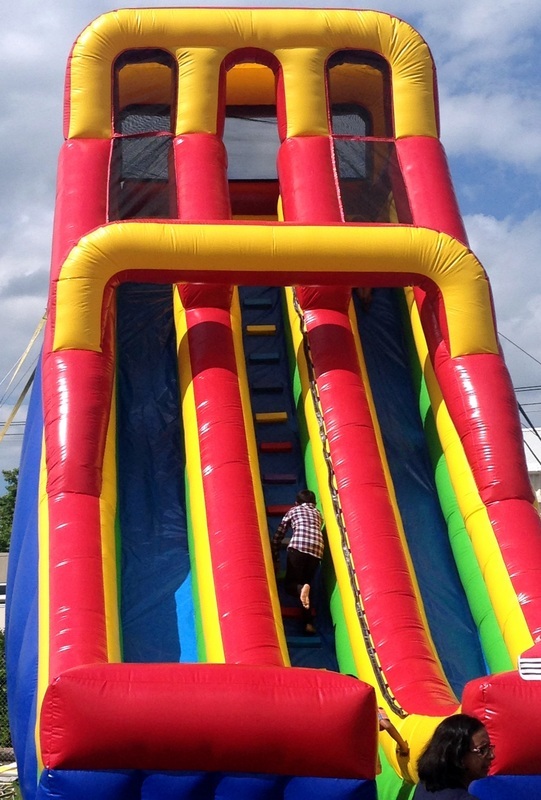 Look out for the giant Cannonball Slide a new feature of the inflatable rides this year. Scale this 10 metre inflatable for an exhilarating high-speed ride suitable for children aged over 6years, teenagers and adults. Definately not for the fainted-hearted. This year we are trialling a new system with GALA DOLLARS. All stalls and rides will accept the Gala Dollars and we hope this will speed up the queues and be easier for everyone. This year we have Parent Ambassadors for each class to help organise volunteers for the Gala, and also to assist the teachers during the year with coordinating class events, trips and liaise with our families within each class. Keep and eye out for your classroom Parent Ambassador - the list of parents who have kindly volunteered for this role will be out shortly. Winner - Principal for a Day! Looking forward to the line up for Mega Splash! Mr McKernan is booked for 11am, keep an eye out for Miss Piritt, Mr Hacker and Mr Thorton. Want to get dunked please contact Megan on 021 818 537 to book your time! Samsung 16GB Tablet to be won! A fantastic Samsung Galaxy Tablet 16GB (worth $559) to be Won on Gala day! Just enter your name into our draw when you come to the Gala. Conditions apply. One entry per person. Winner must be onsite to claim the prize when it is drawn. This blog is a collaborative effort from members of the Gala Crew to keep you up to date with the latest news about our gala.